Little Keira's Bows: A Sweet Little Cutie Angel!!! A Sweet Little Cutie Angel!!! Isn't this baby such a sweet little cutie angel!!! 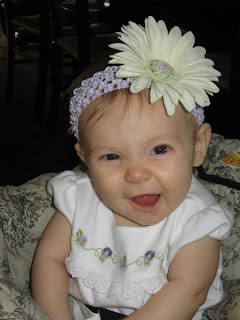 She is wearing flower headbands that were made by Little Keira's Bows. I can't believe how well the flower headbands match the flowers on her outfits! Thank you for sharing and you too can earn a 10% discount on your next purchase by sharing pictures of your cutie wearing hair accessories made by Little Keira's Bows!